Subscribe to receive transmissions of sound and light from our hearts and minds (new music releases, tour date announcements and sacred sound works). Dream Seed's Debut Album "Sound of Light" is out! "Sound of light" Features live recordings from 2014-2016. 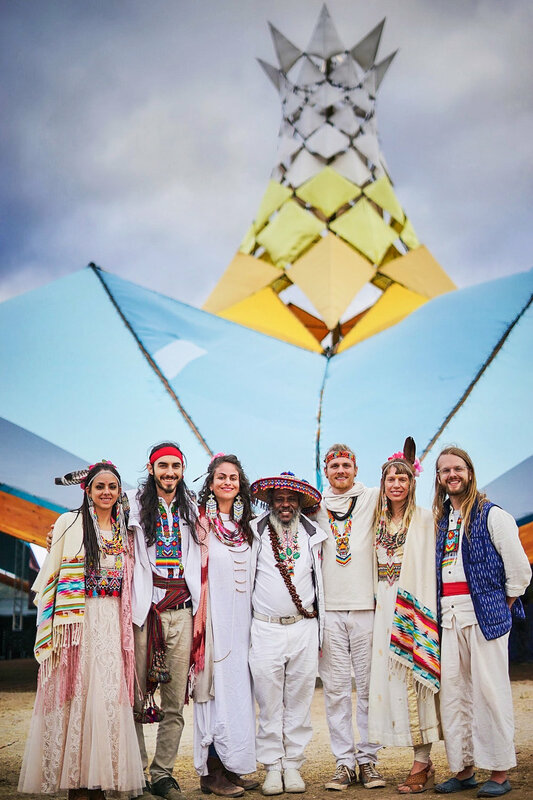 Dream Seed is a sound healing ensemble created by members of Golden Drum, Sacred Arts Research Foundation, The Heart and mind festival and Didge Project. Shamanic chanting, mantras, overtone singing, Native American songs, indigenous music, didgeridoos, crystal singing bowls, bells, gongs, harmoniums, tuning forks and other overtone-emitting instruments are used to create an environment conducive to deep relaxation and inward investigation. Participants are led through guided meditations and sound healing practices designed to harmonize body, mind and spirit. Tonight’s event was a spiritual ceremony first and a concert second. Not because the music wasn’t the most transcendent but because the function felt like it was to to connect with our souls and to elevate us and to heal us rather than simply to deliver music for enjoyment or entertainment. 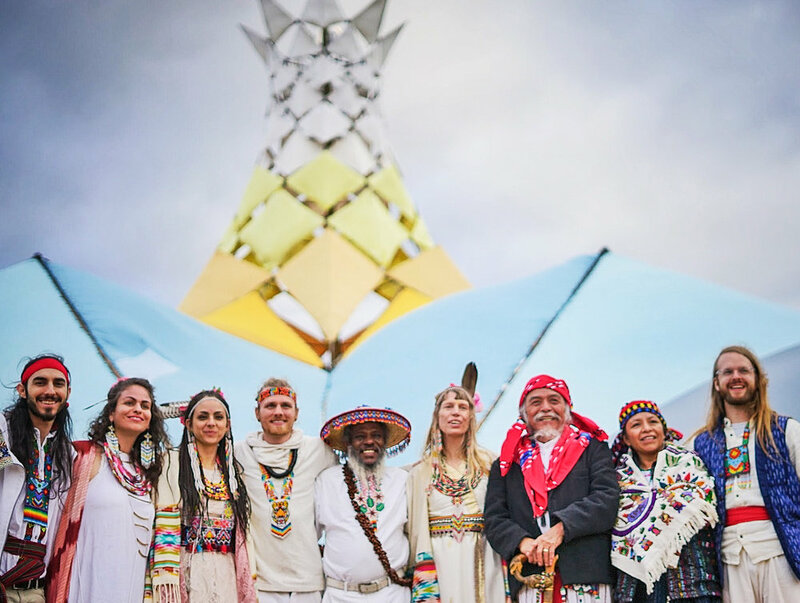 Members of Dream Seed are active as organizers of the Golden Drum Community and the Sacred Arts Research Foundation and are students of Maestro Manuel Rufino, a recognized Taino elder, spiritual guide and ceremonial leader. With his blessing, Dream Seed was created as a vehicle with which to share the music of sacred traditions of the world. Our affiliations include Made in Prayer, Pink Sun, Brooklyn Light, Jungle Cafe and Didge Project. We have spent over 7 years in a deep study in Brooklyn, NY cultivating our art, music and programs through our practices and disciplines from the tradition. Brooke Gillespie is a disciple of Maestro Manuel Rufino, an active member of Golden Drum, a cultural community center for consciousness in Brooklyn, and a member of the Initiatic College; learning the traditional Native American healing ways and sacred wisdom traditions. Brooke’s mission is to help people remember that life is sacred and to be in service to the mission of peace for humanity through educating, inspiring and reconnecting people to the sacred wisdom traditions and indigenous knowledge. She is a visionary vocalist, sound healer, song-writer and song carrier of sacred music from all over the world including Native American traditional music from South, Central, and North America, Tibetan and Sanskrit mantra, African songs and more. Brooke is a founding member of Pink Sun, a shamanic ceremonial music group and a founding member of Dream Seed. She believes in sound, vibration and music as universal methods of healing, awakening, consciousness and bringing peace to humanity. AJ Block is a musician, healer and teacher inspired by spirituality and sacred traditions. He is a student of Maestro Manuel Rufino and co-director of the Sacred Arts Research Foundation. As director of the New York didgeridoo organization Didge Project, AJ has spent nearly a decade developing creative businesses. As a Certified Integrative Sound and Music Practitioner AJ works with individuals and groups who seek healing through sound and music, most often with the didgeridoo. For More about AJ and his work, visit Didge Project at www.didgeproject.com. Matthew is a founding member of Dream Seed and Golden Drum, a cultural community center in Brooklyn, a member of the Initiatic College, and has been a disciple of Maestro Manuel Rufino since 2008. During that time he has studied Reiki, Native American healing and music as well as sacred songs from other indigenous people from around the world. Matthew has focused his musical studies on singing and percussion including the Native American water drum, hand drum, tabla, and djembe. He has a great love for kirtan and other forms of chanting. He is also a member of Pink Sun, a band that shares sacred music. His mission is to use music and art for healing and as a tool to aid in the evolution of consciousness. Matt is also a graphic designer, animator, illustrator, and painter. You can view his work at http://mattcanale.com. Jerry Walsh is a musician, vocalist, and beatboxer mixing ancient instruments and techniques such as the didgeridoo, Peruvian pan flute, hang drum, and Tuvan throat singing with experimental hip-hop rhythms and lyrics revolving around mysticism and social activism. He has performed and taught at Sonic Bloom Festival, Gratitude Festival, Mysteryland Festival in Chile, Unifier Festival, and Alex Grey's Chapel of Sacred Mirrors. Jerry has worked alongside internationally acclaimed sculpture artist, Kate Raudenbush, for the past three years bringing large scale laser-cut steel allegorical and spiritually inspired installations to Baltimore, New York City, San Fransisco, Black Rock City, Amsterdam in the Netherlands, and Santiago in Chile. Tommy Harevis is a multi-instrumentalist focusing specializing in ethnic flutes from many regions of the world that He collects and uses during recordings and concerts. “I Compose music based on the emotions and inspirations that comes from poetry, traveling, images and stories. I try to make my music according to the intention. To most tenderly reach the heart of recipient, sometimes in order to pick You up to dance and other times to motivate You to perform courageous actions. Alyona mindlin is a healer, yoga and thai massage therapist, and sacred song carrier. She has dedicated her life to helping people through the healing arts. Alyona has taught yoga for 9 years predominatly in NYC. She has traveled to teach worldwide and has lived in Tulum, Mexico and Maui Hawaii. Adrian DiMatteo is an international performing and recording artist, music educator and sound healer with over 16 years experience in the music world. He performs original songs and carries sacred chants and mantras from ancient native, tribal, and indigenous cultures. He is the creator of “Guitar Handbook”, an iOS app for aspiring guitarists of all levels. Adrian teaches guitar, voice, music theory, songwriting and the principles of sound healing. His workshops, lessons and private sessions draw upon both technical academic expertise and ancient spiritual knowledge passed down by elders of the traditions, including his teacher Maestro Manuel Rufino of the Golden Drum in New York. Originally from Poland, Mateusz is mult-inistrumentalist and music producer, currently living and creating in New York. In his work, he explores the borderline of music and personal growth. His music is deeply rooted in a world of spirits and is treated as a spiritual practice. For several years, he is practicing under the supervision of Elders of indigenous cultures from many parts of the world. These special offerings are led by the members of Dream Seed. To book one of these workshops please contact us. To find out when these workshops are next happening in your area please visit our tour page. The drum is a sacred instrument that invokes the heart and speaks a universal language. Its rhythmic heartbeat is at the center of ceremonies held by people all over the world. The shamanic drum is used to communicate with the Spirit and to connect our hearts with the heartbeat of the Earth. It is a powerful medicine that heals the body, heart, mind, and spirit. In this workshop we will come together in a sacred space to create our own ceremonial drums and learn a frame drum-tying technique that we received from our communities spiritual leader and elder, Maestro Manuel Rufino. We will be making one-sided hand drums, using wooden frames made of maple and elk, deer or buffalo hide, and sinew. The creation of the drum is a prayer and a ceremony in itself. We will work with our drums as a visioning meditation for our lives and our paths, so that our thoughts and intentions remain in a high vibration as we create the drums and through that process they become part of the drums. During that time we will share and listen to sacred songs from different Native traditions. Making your own personal drum is a sacred journey and the power of making something like this with your own hands is incredible, it becomes an extension of your own heart & mind. Cost includes drum materials and art supplies. Join us in an intentional study group for sacred song practice. Together we will create an environment that promotes the development and deeper learning of traditional sacred songs from around the world. Our goal is to implant these sacred chants in our hearts so that we can share them in prayer, personal practice and strengthen the global sacred song community. We begin our classes always by honoring the directions; we ask that you come on time, so that we can open the space together in a good way. This 3-hour workshop will cover the fundamentals of didgeridoo playing including: diaphragmatic breathing, the drone sound, harmonic overtones, cheek and ab rhythms, animal sounds, and the basic techniques of circular breathing. 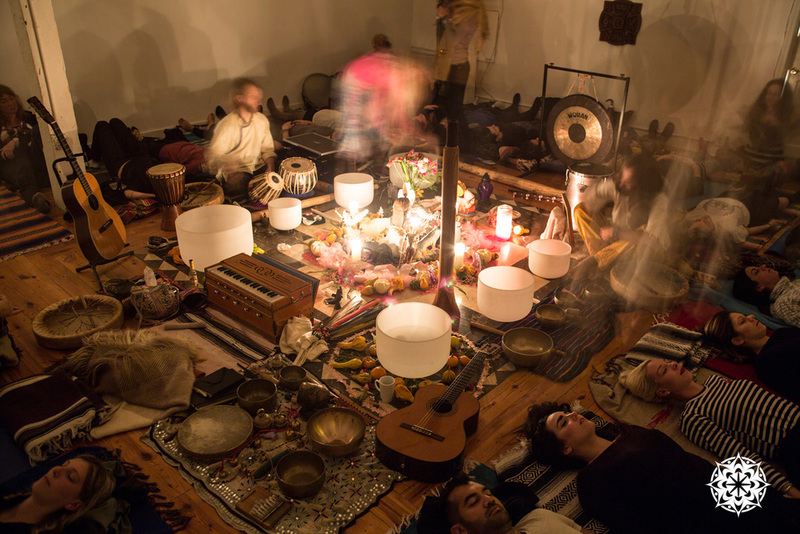 Additionally the workshop includes a sound meditation where participants can either be up and meditate or lie down and as Dream Seed members play a number of different sound healing instruments such as the pan flute, the Native American drum/shaker, tank drum, singing bowl, jawharp, gong and didgeridoo specifically on various energetic centers of the body incorporating throat singing and ceremonial songs from the Native American traditions. A sound meditation will help allow the first half of the workshop sink in to your muscle memory, and be refreshed and inspired to learn for the next portion of class. The workshop will conclude with a focus on world rhythms, beatboxing and guiding people into working and experimenting with the full range of their voices and exploring singing through the didgeridoo, which easily creates amazing transcendental sounds and is still rare to come across in the didgeridoo world even with experienced players. If participants are experienced we can begin to cover the process of learning to incorporate lyrics and normal singing intermixed with didge playing and cover more complex rhythms and advanced beatboxing effects. A sonadora is one who is a sacred sounder, one who heals with sacred sound and vibrations. Sacred sound is an ancient science that is based on vibration, frequency and intention. In this workshop series we will focus on learning sound healing techniques, awakening to your inner voice and intuitive energies and opening the pathways to working with sacred sound. We will focus on opening the voice through vocal exercises, sacred mantras, indigenous songs and chants. We will work with quartz crystal singing bowls, tuning forks, tibetan singing bowls, gongs, flutes, bells, drums, rattles and other sound healing instruments to explore and learn how to create healing spaces with sound. We will study elements of sacred sound, color, the medicine wheel and the elements, the chakras and various movement techniques to get into the body, move energy and access our intuition. Participants are encouraged to bring their own sound healing instruments to work with but there will be crystal singing bowls and other instruments available. It is recommended to bring your own instrument so that you can begin to develop a deeper relationship with it and learn how to work with it.